I passed this old school house one day while just driving down the road. I wanted so badly to get closer and take better pictures, but my kids were with me and there was a No Trespassing sign. I didn't think it would set a great example for me to cross it with them watching. Ha! I love that this school is still standing though. I think about all the children that were taught here. How they learned about God right along with their spelling and math. Of course God is a taboo subject in schools these days. But that won't ever stop us from teaching our kids about Him. Gorgeous! Okay, if I was there, I totally would have trespassed with you. After blindfolding the kids, of course. Awesome! I would have trespassed with you too! You could have bribed the kids just once not to say anything! LOL! i am in love with that little schoolhouse. i would have wanted to trespass as well! i hate that they can't teach God is school now. but i am learning to take every day situations and teach my children the truth through them. That is just beautiful Beki!! Too bad you couldnt get closer but the view you had was pretty awesome. God is good. Love the verse you picked. I love everything about this post. Now I better go put together my Fingerprint Friday. What a beautiful picture. Isn't it odd, that being a Christian is the one thing the ACLU likes to go after. Can't say "Merry Christmas" or call it a "Christmas Tree",etc.. because it is not correct..What I find interesting, Jesus taught about love and it seems to bother people. Makes one wonder where this will end. Love this Beki. That school house was just beautiful! Thank you so much for sharing. I'm loving this regular feature on your blog. Hope you have a great weekend. What a beautiful picture. That's a great song, too. Beautiful photo! It really makes me long for a simpler time. Your story reminds me of one time when my 2 older sons were very young (maybe around 2 and 4) and I got lost really badly, and crossed the state line from Illinois (where we lived) into Indiana by mistake. I had to pay like 25 or 50 cents to go through an automated toll booth, then turned around, and all I had left in my purse was a $20 bill, no change. So I ran through the toll booth without paying (this was back when there were no barricades) and an alarm blared at us as I was driving away. My sons kept yelling, "MOM BROKE THE LAW!" Of course they didn't understand about the money and not wanting to go search for a store to get change and risk getting even more lost. But I felt terrible about such being a bad example. Old school houses are so neat. And great verse. So glad God gave us the privilege of teaching our kids about Him. It's a huge responsibility, but a great privilege. Just a beautiful post, all the way around. I, too, long for the time when we weren't prohibited from teaching school children things that really matter. Anyone else remember when being chosen to say grace in the lunchroom for the entire student body was just about the biggest honor one could attain in grade school? That is such a Kansas picture and something I miss soooo much! I LOVE it!! Want to know something kind of cool - my Uncle now owns the farm land that my Gandma (his mom) went to school on - when they bought the land the school house was STILL there and it is to this day. It was so amazing when I was little to go and play in that old house and think of my Grandma going to school there. I've driven by that school house (I think . . north of Florence?) and always been fascinated by it. Nice photo! I linked to you on my blog today :) Thanks for the gummy candy corn tip! but you were good and were rewarded with a great shot! Recently I gathered in front our local high school with my daughter for "See you at the Pole". Over 30teenagers stood before their peers joined hands and prayed. I was so humbled by the expereince. Absolutely perfect. Isn't God the most amazing artist? And architect? And...you captured a glimpse of His creativity and it's perfect. 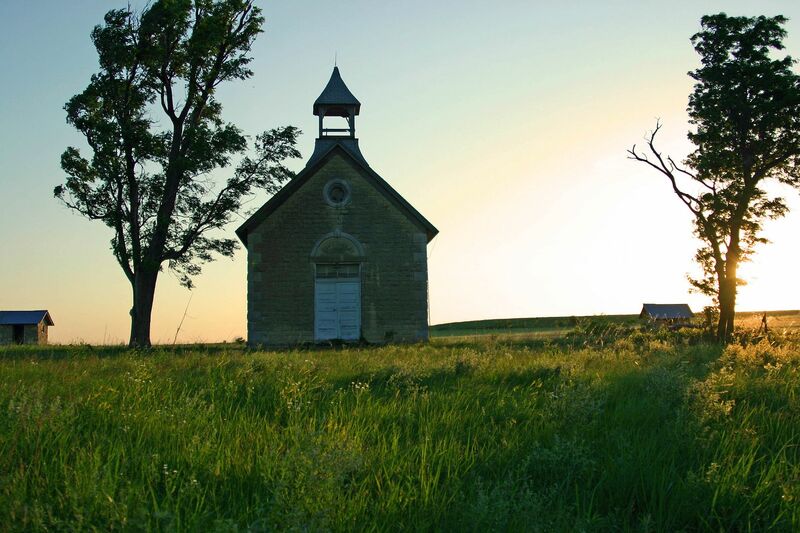 LOVE this picture of the old Schoolhouse! !